In compliance of the common order of the Hon'ble Gauhati High Court dated 26.07.2018 in WP(C) Nos. 1100, 1144, 1215, 1221, 1283, 1313, 2221 and 2358 of 2018 in connection with condonation of overage of candidates for the post of Veterinary Field Assistant (VFA)s under A.H. Veterinary Department, Assam and other similar orders passed by the Hon'ble Court thereafter in the same matters in other Writ petitions and in pursuance of Government's concurrence vide Letter No. VFV.133/2013/518 dated 02.01.2019. 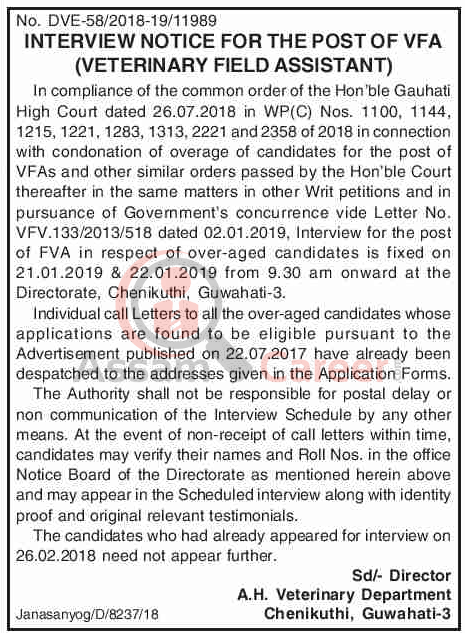 Interview for the post of FVA in respect of over-aged candidates is fixed on 21.01.2019 & 22.01.2019 from 9.30 am onward at the Directorate, Chenikuthi, Guwahati-3. Individual call Letters to all the over-aged candidates whose applications are found to be eligible pursuant to the Advertisement published on 22.07.2017 have already been despatched to the addresses given in the Application Forms. The Authority shall not be responsible for postal delay or non communication of the Interview Schedule by any other means. At the event of non-receipt of call letters within time, candidates may verify their names and Roll Nos. in the office Notice Board of the Directorate as mentioned herein above and may appear in the Scheduled interview along with identity proof and original relevant testimonials. The candidates who had already appeared for interview on 26.02.2018 need not appear further. Official Notice: Click Here .